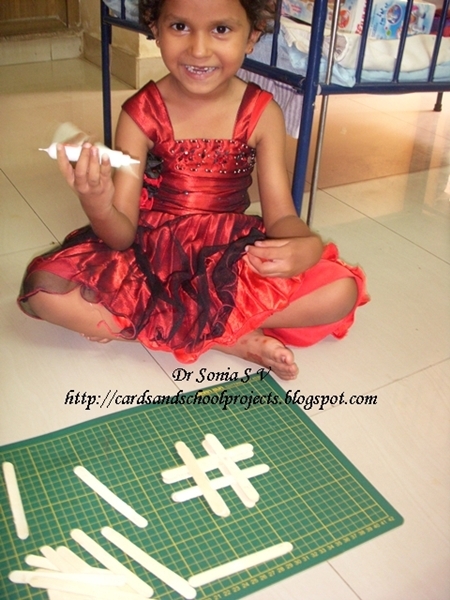 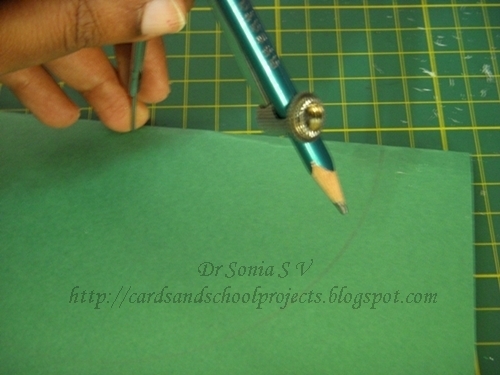 This Swinging card can also be called a spinning card as the quilled central circle can spin 360 degrees! 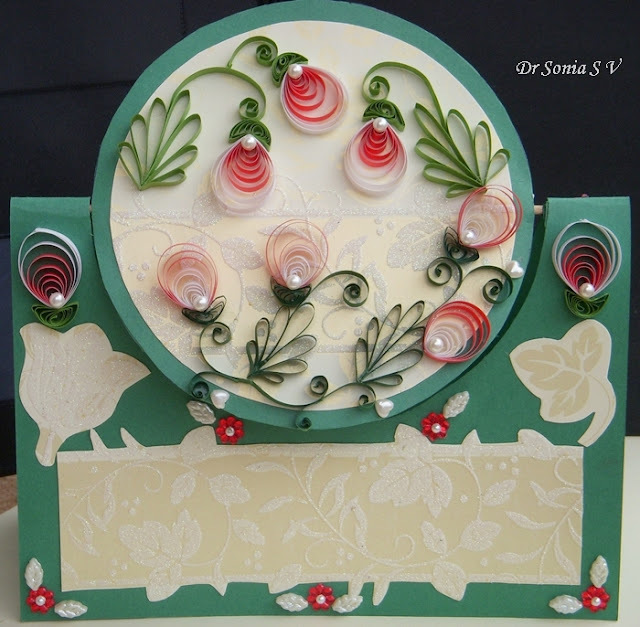 I saw this type of swinging card at a commercial card selling site [cant remember which site] and was so fascinated that I tried to work out the mechanism of this interactive card.This is a friendship card for all my blogger friends who inspire ,support and encourage me constantly. 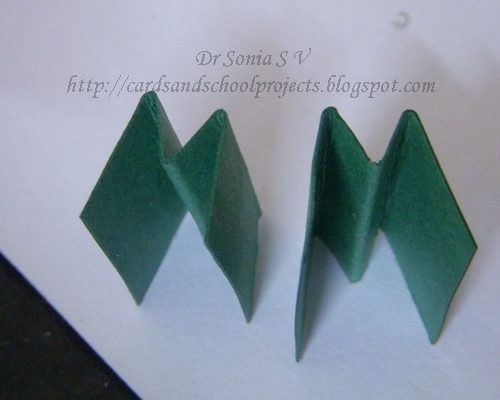 This is one side of the swinging card which spins on a wooden skewer on top of the card stand. I made the red flower and its leaves by looping paper strips by hand. 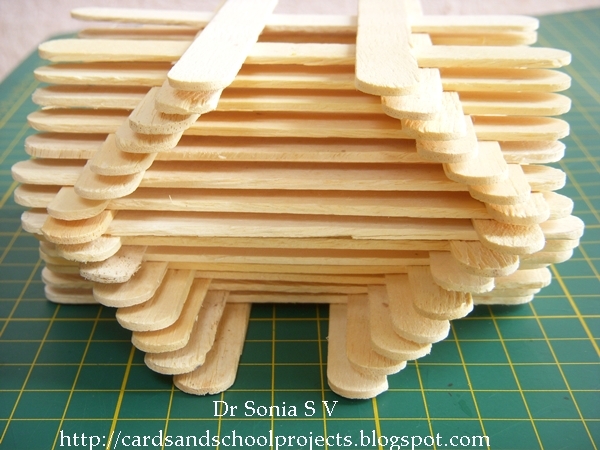 I found that though not as perfect as the proper husking technique using pins on a board to form the loops its much faster and more fun! This is the closeup of the quilled flower bud again looped by hand. 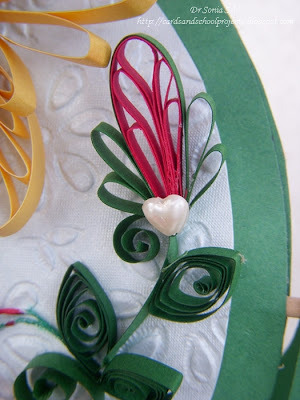 The quilled rosebud is made by forming a tight coil and pushing its center out. 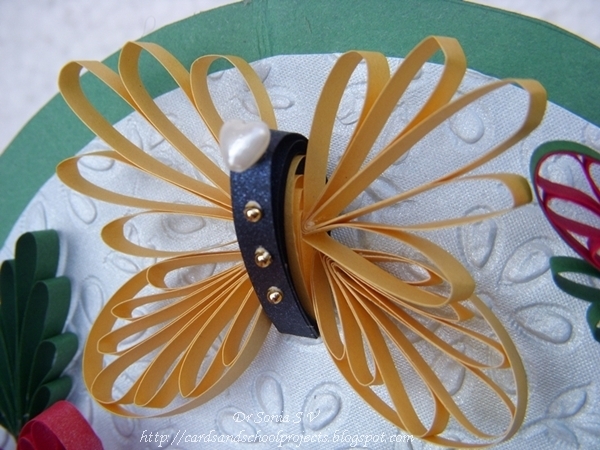 The golden butterfly is also made by looping paper strips held in the hand. 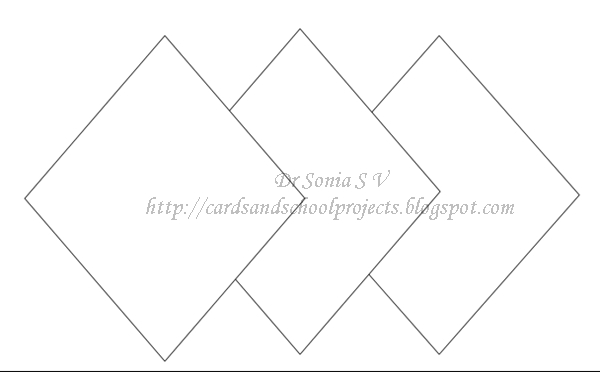 The other side of the swinging card also needs to be embellished as this swings 360 degrees and comes onto the other side.So while making it ,its nice to have images that look ok upside down too! 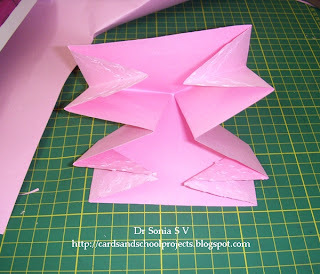 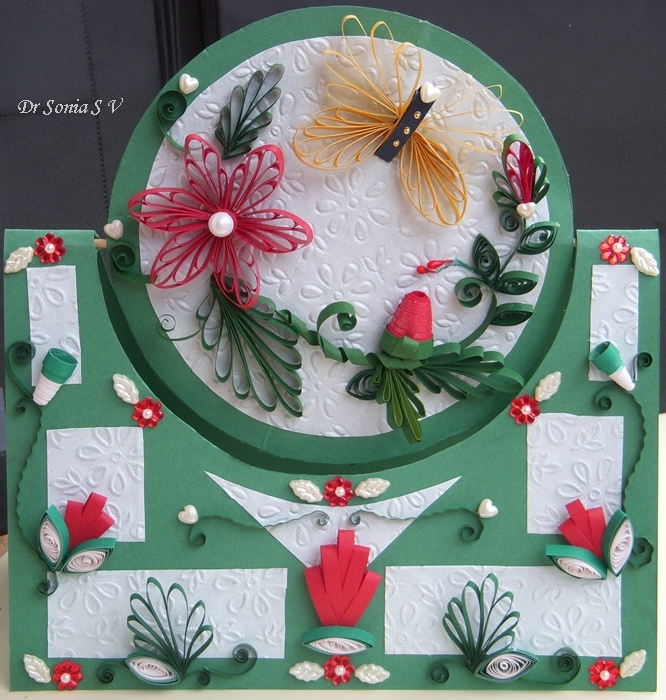 The central Swinging card part is embellished with eccentric coil quilled flowers. 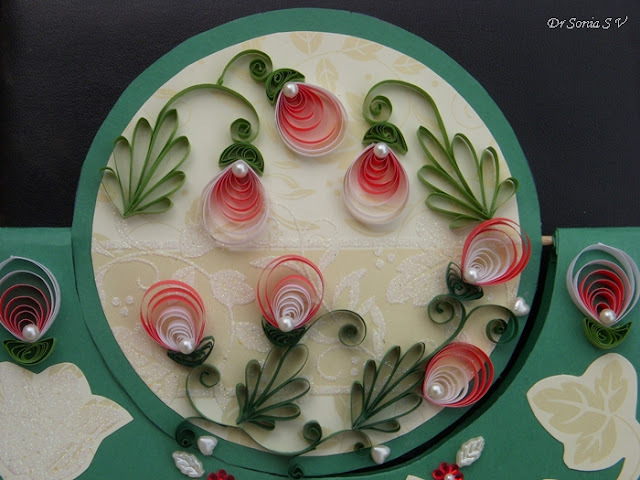 These quilled flowers are eccentric coils. 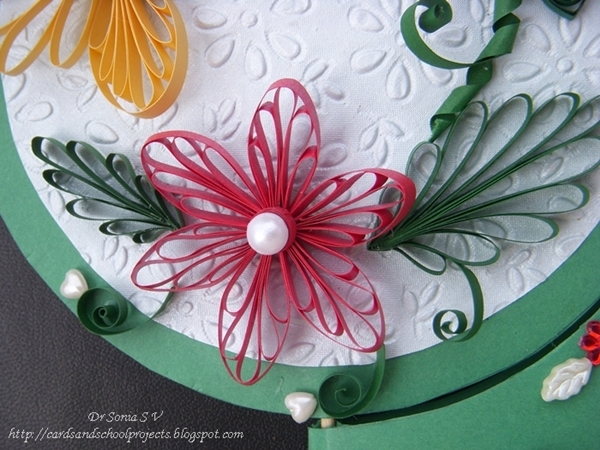 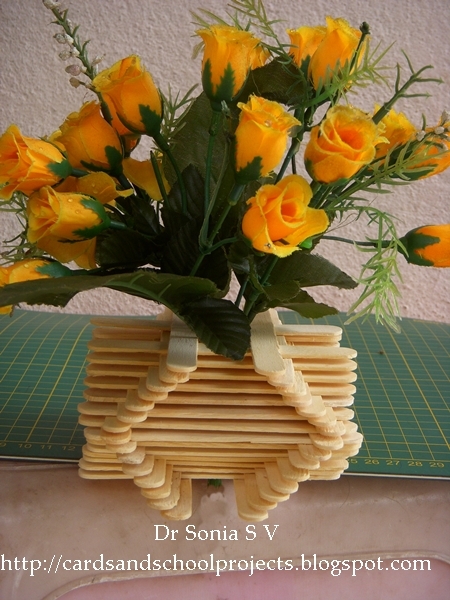 The eccentric coil flowers are made with paper strips having 2 color tones. 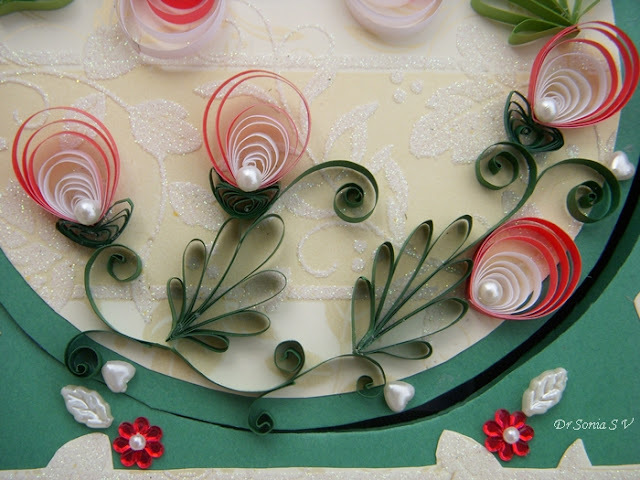 I reversed the direction of coiling to make the white in the center for the lower quilled flowers. 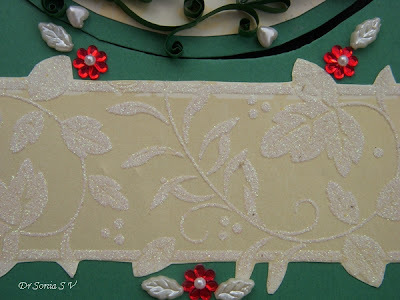 This gorgeous embossed paper was a paper bag I cut up and recycled! 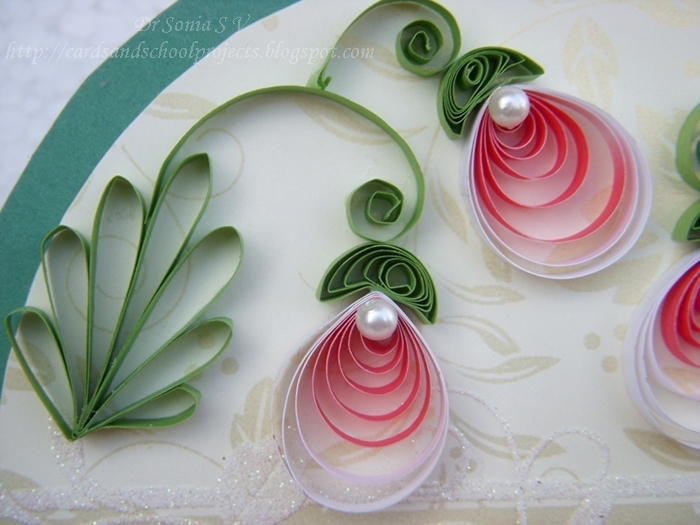 The pearl leaves and pearl hearts are from a local fancy store. 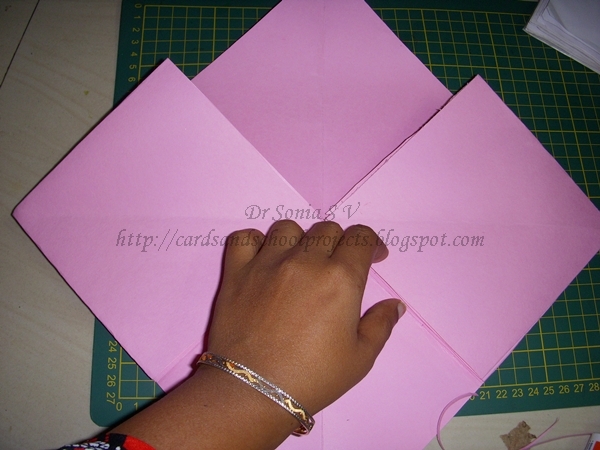 Thick Card stock- The base card which forms your stand for the spinner needs to be particularly strong as it is a stand for your card and has to support the weight of your wooden stick and spinner card.The spinner card also should not be thin as otherwise it will be floppy and unsightly. Glue dots or any other adhesive of your choice to stick the skewer to the spinning card. 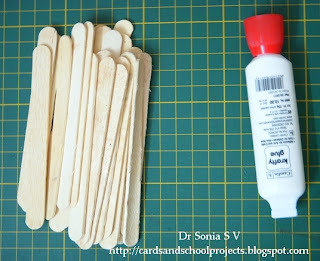 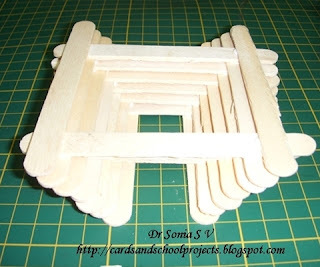 Wooden/plastic/ metallic stick to form the basis of your spinner card mechanism.- I used a wooden skewer. Use any long thin stick. 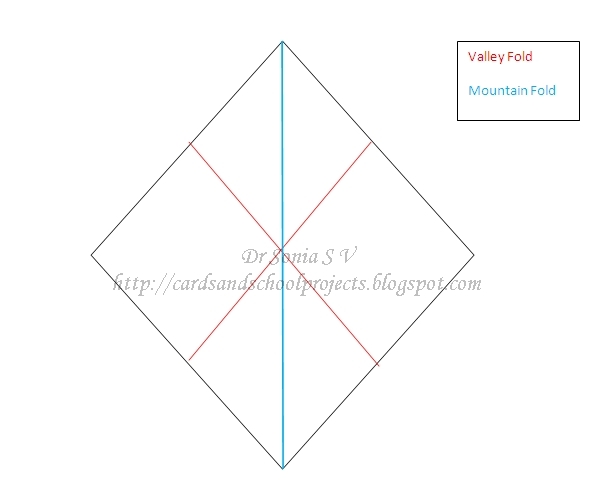 Fold your card stock in half. 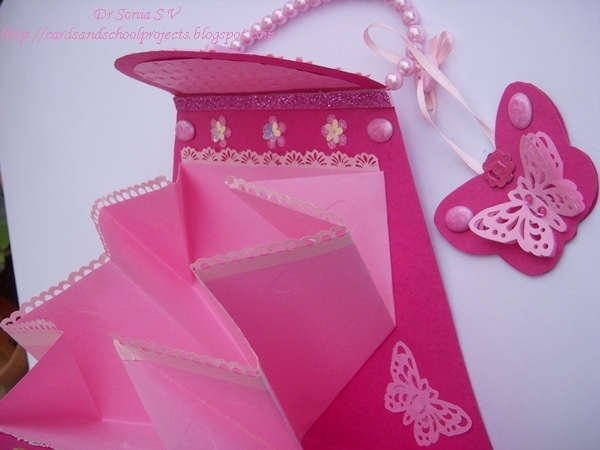 I have used an A4 sized card. 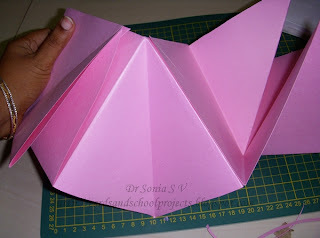 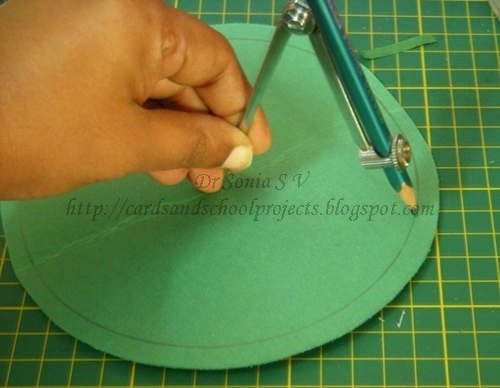 Cut out a shape at the folded edge- you can cut out a semicircle,rectangle,half of an octagon etc.I cut out a semicircle marked with the help of a compass. 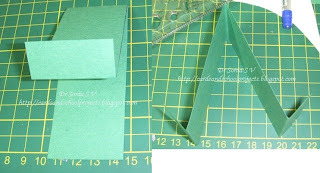 Use the shape you cut out and make it smaller by a centimeter or so.Here I made it smaller by a 1/2 a centimeter only and discovered its better if you make it smaller slightly more so that it can swing and spin freely once attached to the card stand. You need 2 similar sized circles for the swinging part. 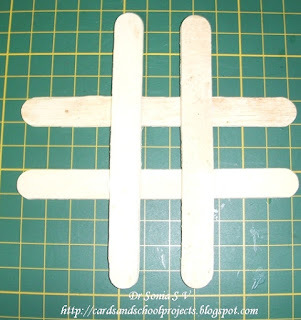 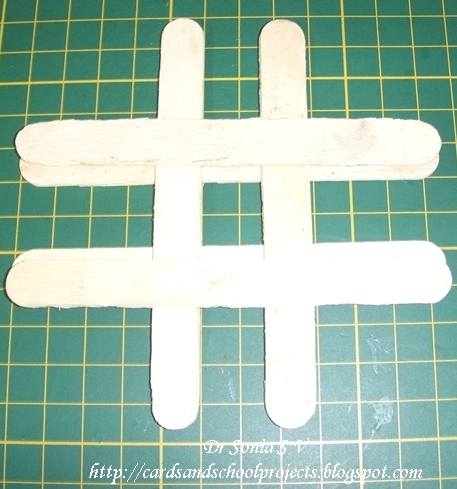 Embellish the circles before you stick them .Use an adhesive of your choice to stick the skewer or stick to the center of your swinging card.Here I used glue drops to stick a wooden skewer. 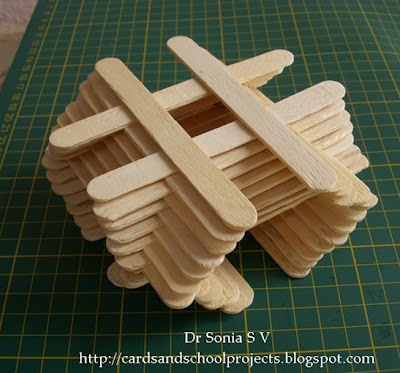 Apply glue and stick the 2 circles together. 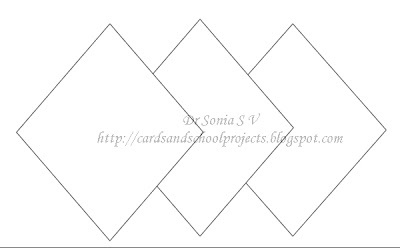 The photograph below shows the mechanism of the swinging card and how the card strips are stuck in position. 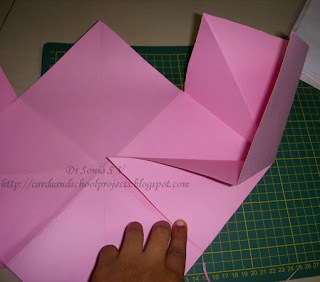 Your swinging card mechanism is ready!Here is the swinging card in action viewed when it is spinning and has swung up! 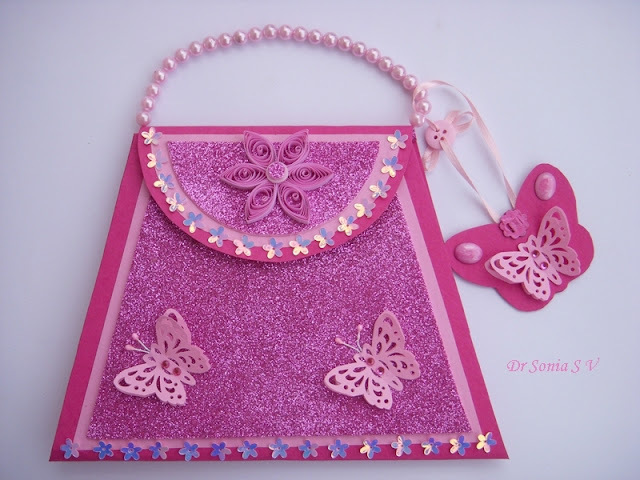 I was crazily busy the last couple of days professionally with a couple of international patients requiring surgery and extra care. I was on a deadline to make a friendship card for the Guest DT post at Crafty JC [my Ocean Diorama Pop up card had become top 3 at Crafty JC] and perhaps due to exhaustion I just couldn't think creatively and struggled for ideas. 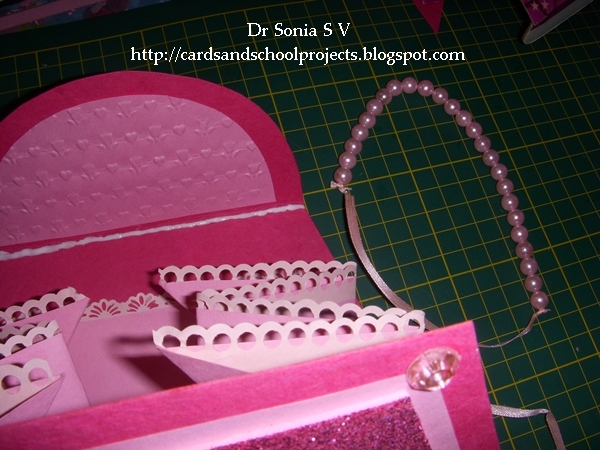 The swinging card is technically easy to make but Oh Boy did I struggle for ideas to embellish it! Please do tell me what you think of it and do try the swinging card mechanism as its a fun interactive card. 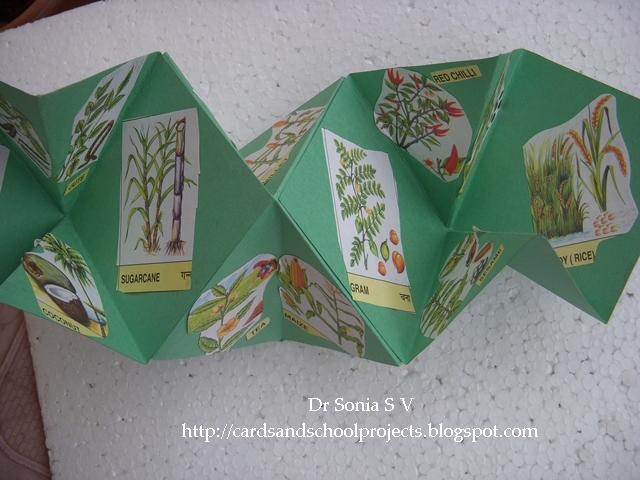 Right now I am in the middle of Plants! [ Daughters school theme this month is on various subtopics on plants! ]When I saw a squash book at Loris blog I knew this was just right for a school project with numerous pictures.If you make one I assure you you will fall in love with it just like I did. My daughter loved it too!The squash book can be made to fit into your palm and open up to a large spread! 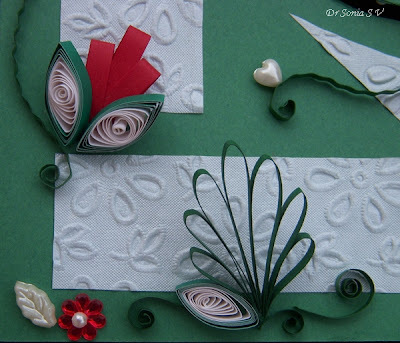 We made this project to incorporate some pictures for the theme "Uses of plants"
You can adapt it to use in a scrapbook or use it as a card you can embellish away! Thickness of paper- as thin or as thick as you want! 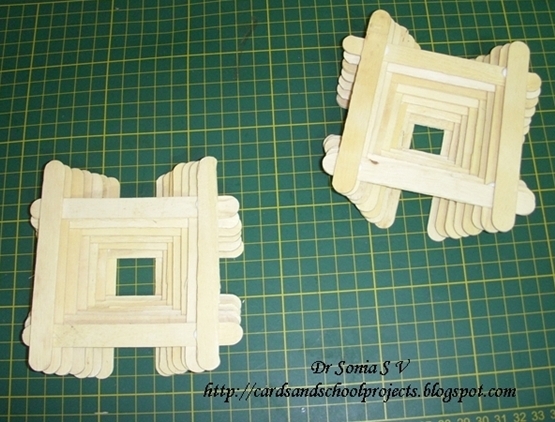 Align the squares as shown. 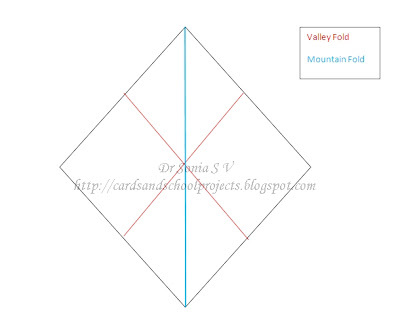 The outer two squares should have their folds in the same way while the central square should have the folds in the opposite way while you lay them on top of each other. 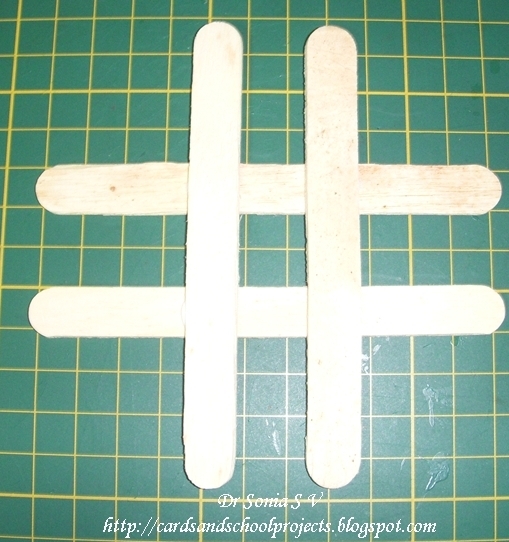 Stick on both the end squares on top of the central square at the place they overlap. 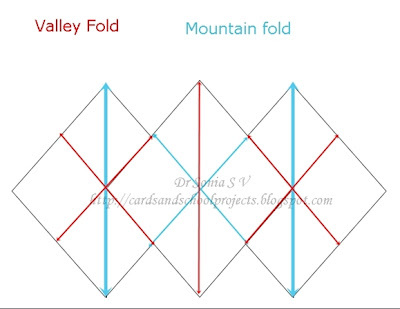 Fold as shown. If your folds are correct you wont have any problem to squash it otherwise you can rework your folds as I have shown in the steps below and still get a gorgeous Squash book! 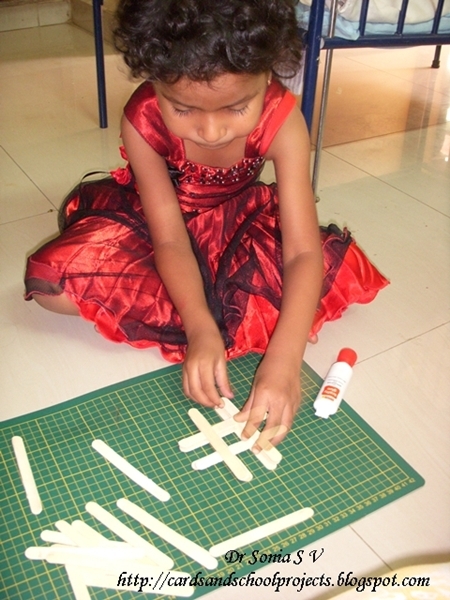 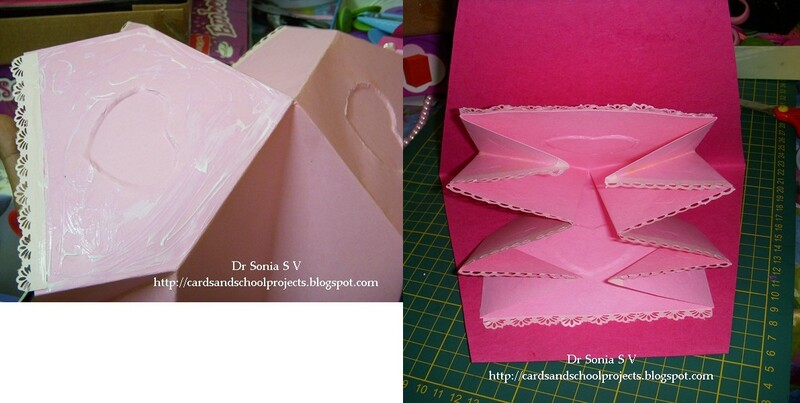 Fold in the lower and upper central folds of your central square and your Squash book is ready! 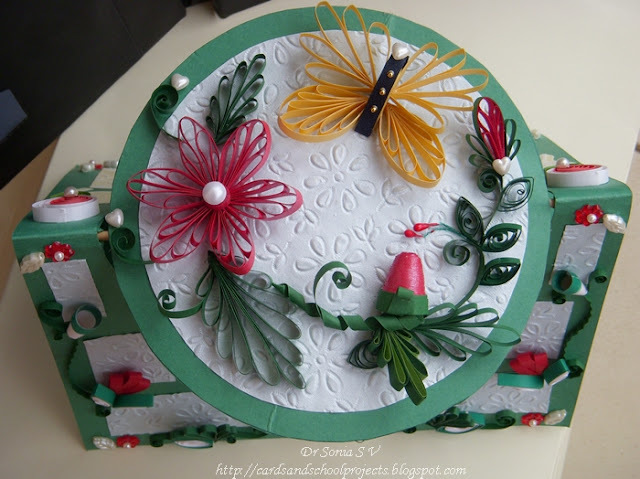 You can hold the squash book folded with a ribbon[like we did], magnet or a Velcro strip.The lovely strawberry ribbon is from my blogger friend Romina - Thank You Romina! 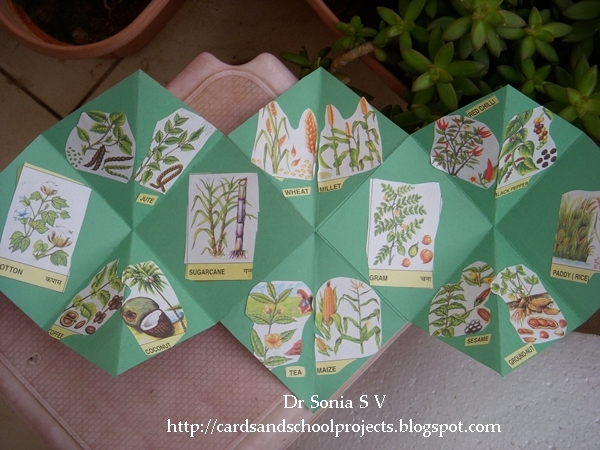 My little one was thrilled with her squash book and stuck all her plant pictures on the panels of the squash book which fitted easily into her school bag. 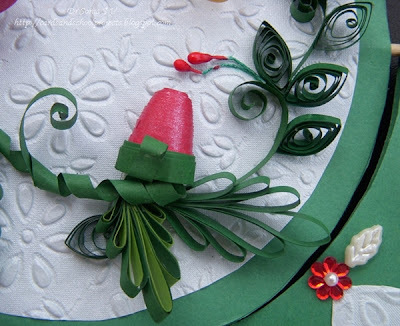 You can stick on both sides of the squash book so there is room for lots of pictures! Make a special card or a scrapbook project with the squash book!Do try it ! 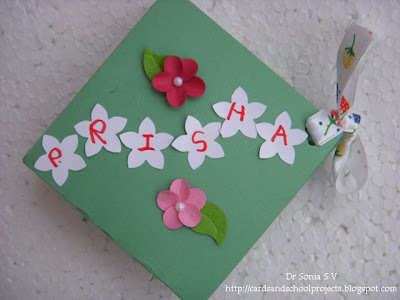 Awaiting your comments on our little project. 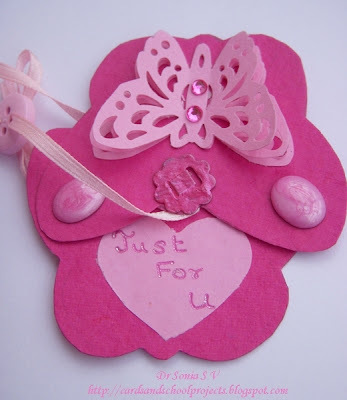 Most of the cards I make are for my daughter's friends and this Pink card is I bet you can guess for a little girl! This flower was made by layering punched paper flowers and adding a plastic flower in the center. 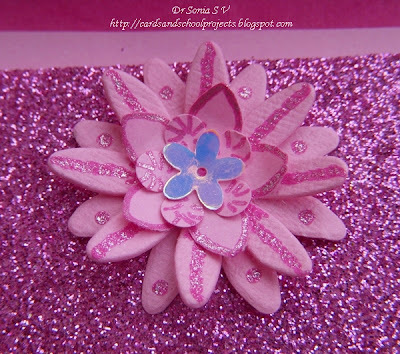 I used dark pink glitter gel pen to add a design to the flower petals. 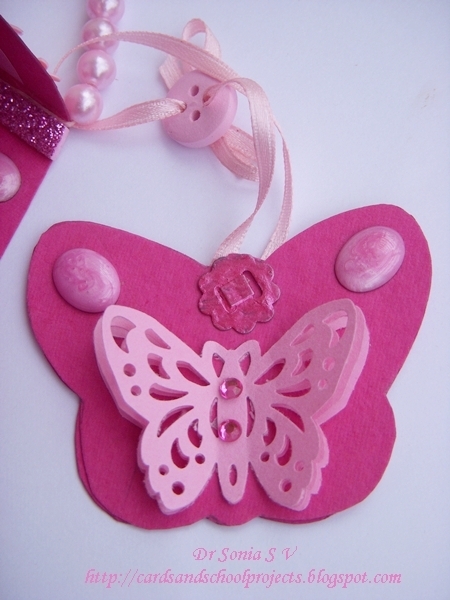 My Butterfly Tag has a 2 layers held with a brad which was originally grey in color painted with pearl pink acrylic . The tag is attached to the purse handle with a ribbon and button. 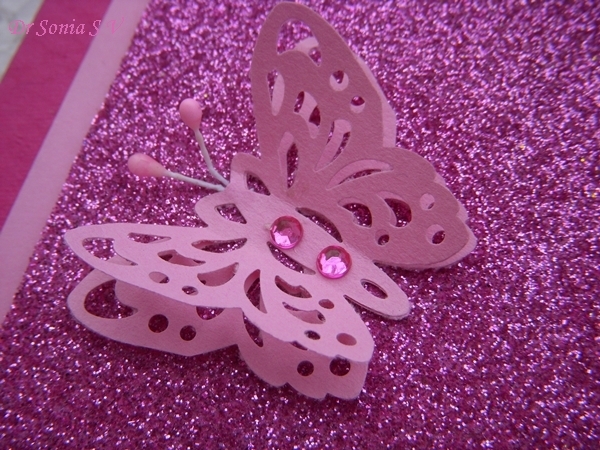 The top layer of the butterfly tag slides up to reveal the sentiment. 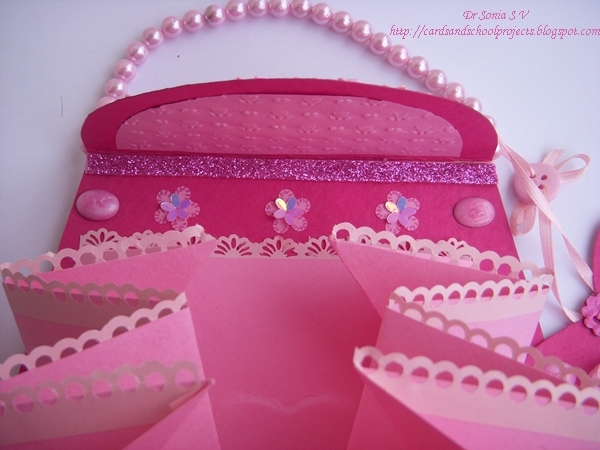 This is the inside of the purse with a fancy folded insert which is embossed with hearts. 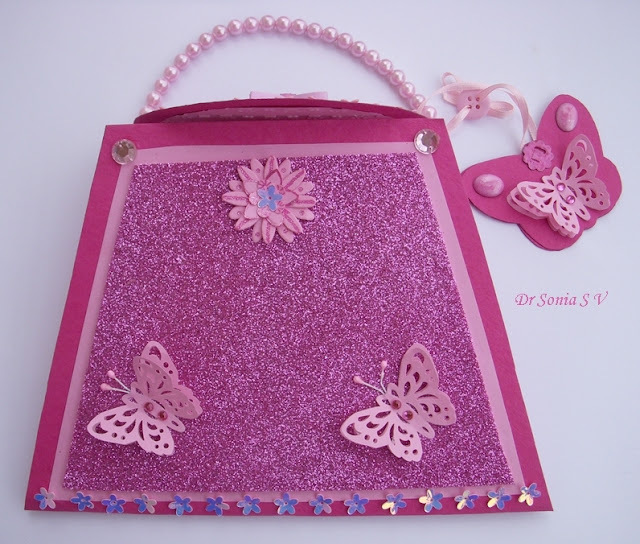 The inside of the purse card has embossing,flowers, paper lace ,gems and butterflies! I embossed the inner lining paper of the purse with hearts and flowers using a Jef embosser. There are many examples and templates of the purse card on the net.Templates are in a way easy and in some ways difficult to work with ,so here I will share how to make your Purse card without any tracing or printing of a template. 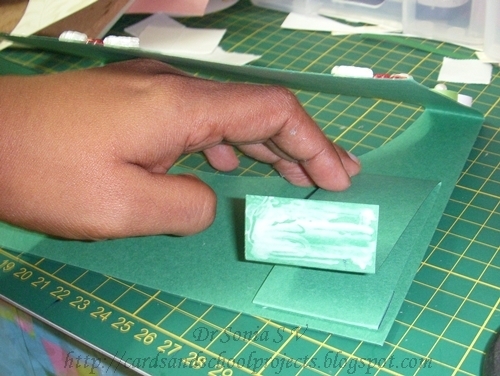 It will measure and look just the way you want it! 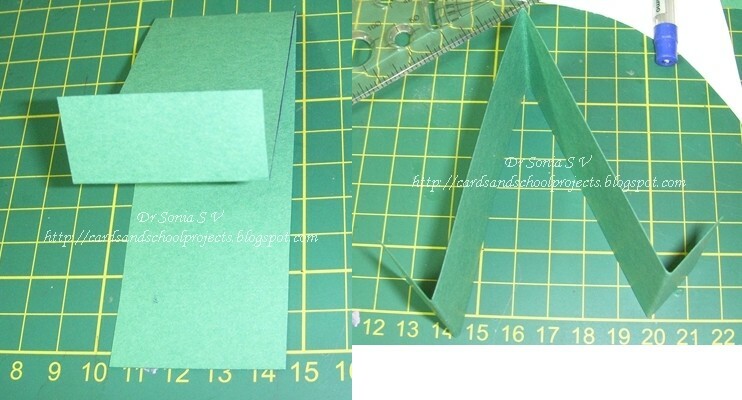 Take a sheet of paper and fold it leaving some over for the flap of your purse--size of the flap depends on you! 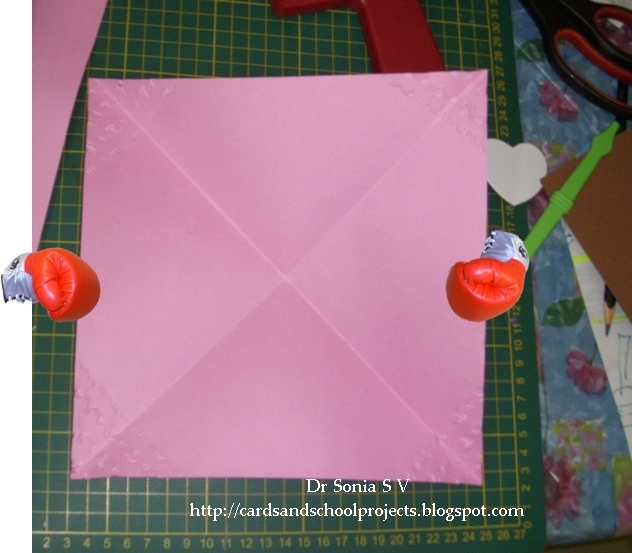 Measure equal distances from the ends of the top edge and drop a line to the lower corners.Cut through both layers of the folded card. 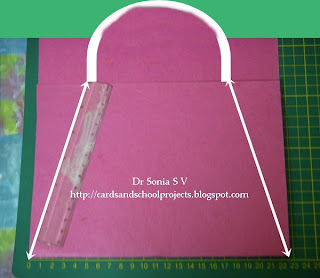 Make the top flap in whatever shape you want.I used a compass to make a simple semicircle flap for this purse card. 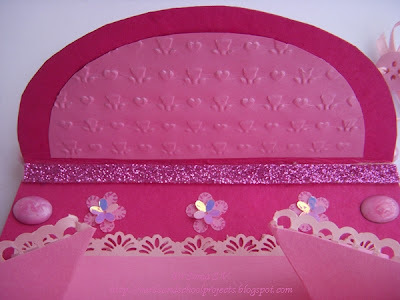 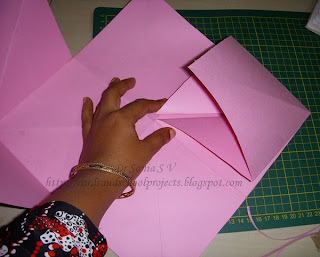 You can finish off your card at this stage or if you are like me and love to dress up the inside of a card- lets make a fancy fold card insert. For this purse card I cut the pale pink paper some millimeters smaller than the card base and layered a smaller glittered foam sheet over it to create a party purse! 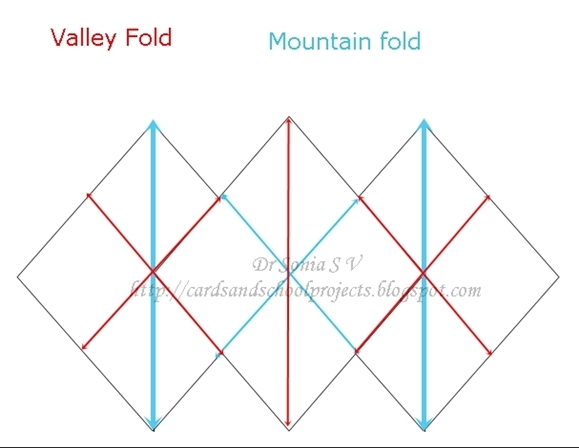 This is called by various names including explosion fold at many sites on the net .Its a very useful mechanism to know as its so easy and can quickly transform the inside of your card ! 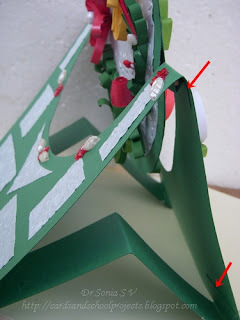 Push the points marked by the boxing gloves to wards each other. I embossed the insert after folding to get my positions right. Since I don't have an embossing machine here is what I did to emboss a large heart.Place the shape you want to emboss [ mine is a cardboard heart] below the paper and gently trace its outline with a smooth flat tool! 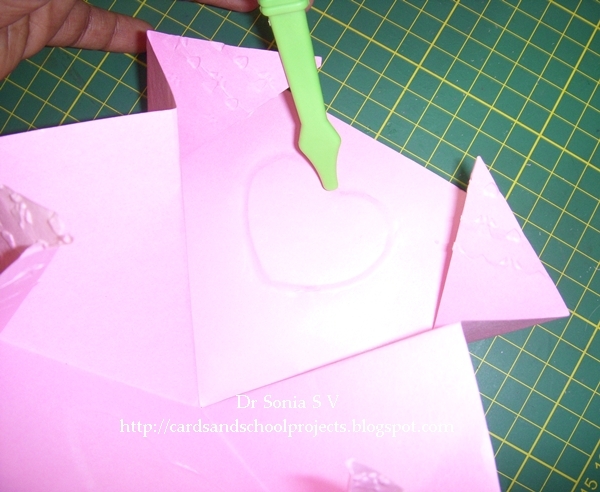 Your paper should be sturdy otherwise it will tear. Once you have embellished your card insert, apply glue on the 5 sided area as shown and stick on one half of your card with the pointed tip touching the central fold of the card.Apply glue on the other side and firmly close your card. How to make a Lacy Scallop Border without a Scallop punch! If you are like me and long to make those beautiful scallops yet don't own a scallop punch - lets improvise! 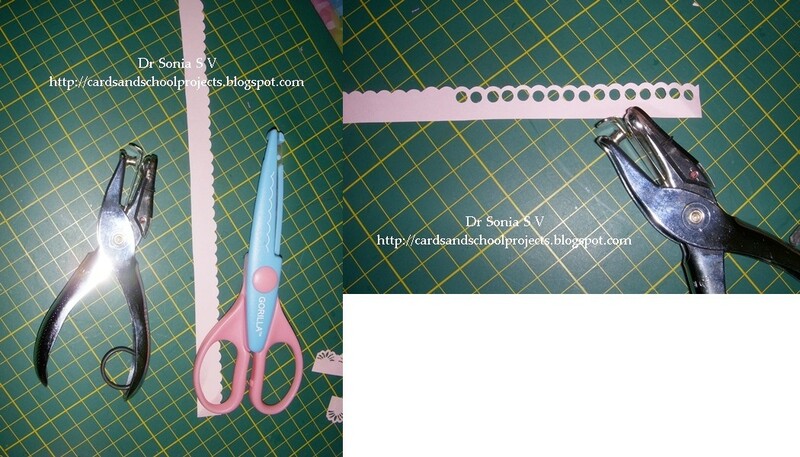 All you need a scallop scissors and a single hole punch. 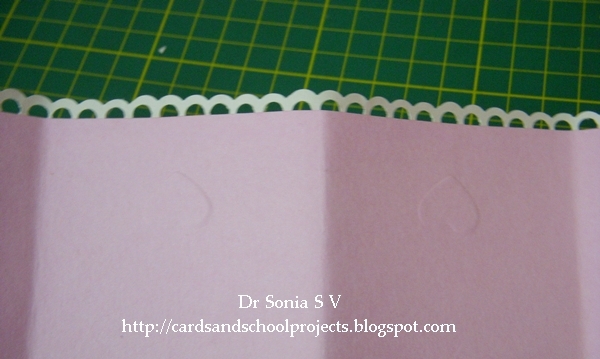 Cut the strip of paper and punch holes. Glue the strip to your card paper and you have a lacy scalloped border! 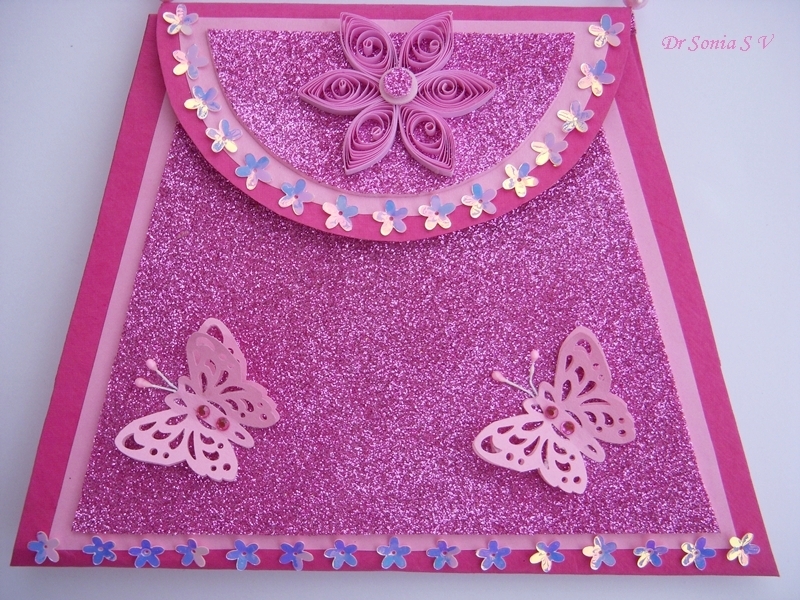 I layered 2 punched butterflies and added flower stamens for the antennae. 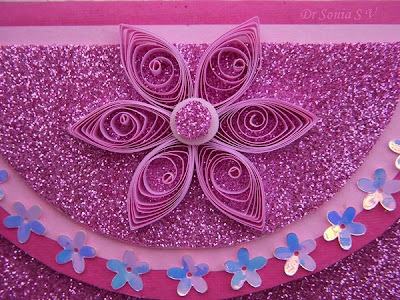 I hope the outcome is OK as this Pink Card will be for my daughters dearest best friend who loves Pink!Do leave me your comments!